The Gateway Arts and Entertainment (A&E) District is located along Baltimore Ave/US Route 1. 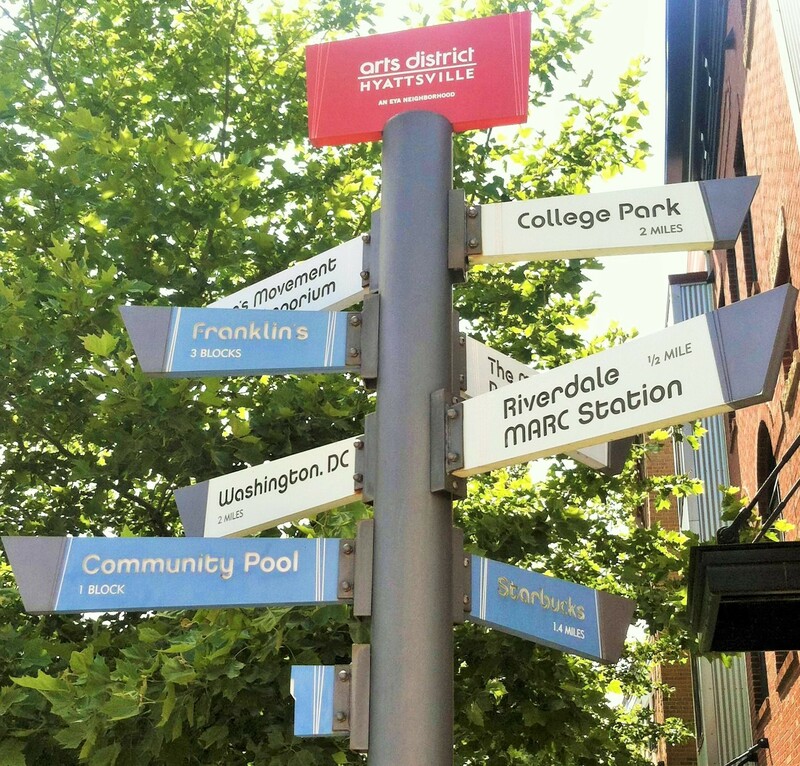 The Arts District runs along Rhode Island Avenue (beginning at Eastern Avenue), then once it turns into Baltimore Avenue, it ends at Oglethorpe Street on the east side and is tailored along Baltimore Avenue to Madison on the west side. Need a visual? View our interactive Google Map. View our interactive Google Map. Facility Municipality Quantity Online Pay to Park? Permit Offered? Pay Tickets? No, garage is open 247. There is a $6 all-day rate. For designated on-street spaces, a permit can be obtained annually for designated areas from the town clerk for a fee. The A&E District is located near and on the following bus routes. We recommend commuters use Route1Ride.org to choose your destination and route. Commuters can also reach the Arts District via the New Carrollton Station (84, F4, F6 hit Rhode Island Avenue & 38th St), the Silver Spring Metro Station (F1, F4, F6, F8 hits Baltimore Ave & Jefferson St), and the Takoma Metro Station (F1, F2 hits West Hyattsville Station then Rhode Island Ave & 38th St then the 34th St Mount Rainier Circle). From the South: Rhode Island Ave-Brentwood Station (Red Line): Take the 83 that runs directly through the Gateway A&E District and is your best route through the district. Alongside the 83, the T18 and 86 turn at 38th Avenue in Brentwood, and stops just one corner from the Gateway Arts Center. From the North: College Park-U of MD Station (Green Line): Take the 83, 86, or The Bus Route 17/Route1Ride, Southbound towards Route Island Ave-Brentwood. The 83 runs directly through the Gateway A&E District to Rhode Island Ave-Brentwood. The Bus 17 runs directly through the Gateway Arts District to Mount Rainier Circle. From the Northwest: The Prince George's Station (Green Line): Take the 86 Southbound towards Rhode Island Ave-Brentwood. The 86 runs parallel then meets Rhode Island Ave. Prince George's Station is a little over a mile's walking distance away. Additional routes include the F1, F4, F6, and F8. From the Southwest: West Hyattsville Station (Green Line): Take the F8 Eastbound towards Cheverly Station or The Bus 13 Southbound. The F8 turns right onto Rhode Island Avenue at Jefferson St. The Bus 13 runs both directions, running through Rhode Island Avenue. West Hyattsville Station is about a mile and a half's walking distance. Additional routes include F1 and F2. From the West: Riverdale Park MARC Station: The A&E District is less than a one mile walking distance of the Riverdale MARC station (Camden Line). Head west on Queenbury Road, then turn left onto Baltimore Avenue. The Gateway Arts & Entertainment District in Prince George's County is located northeast of Washington DC, touching the DC line. Head up Rhode Island Avenue and continue past Eastern Avenue. In two miles (6 minutes), you will cross the Eastern Avenue line into the Arts District. Begin your travels in Mount Rainier and continue south. Need some markers? You'll pass a 7-Eleven on your right a block before you enter the Arts District, and the Arts District begins right at the corner of Newton Square Apartments and the neighborhood of Woodridge, DC. The Arts and Entertainment District continues along Route 1 until you reach Oglethorpe St and Madison St in Hyattsville. We recommend entering into your GPS: 1 Municipal Pl, Mt Rainier, MD 20712 or 5331 Baltimore Ave, Hyattsville, MD 20781. The Gateway Arts and Entertainment (A&E) District is located south of College Park, MD along Route 1 (Baltimore Avenue), starting in Hyattsville, MD. The A&E District continues along Route 1 until you reach Eastern Ave in Mount Rainier. We recommend entering into your GPS: 1 Municipal Pl, Mt Rainier, MD 20712 or 5331 Baltimore Ave, Hyattsville, MD 20781. Take Exit 11A towards Washington, DC onto I-95. When I-95 reaches I-495, stay right at the fork towards Silver Spring and stay in the left lane, then take the first exit on your left (it’s quick) after the fork towards Route 1. There, you’ll take the first exit on your right before the weigh station, and stay in your lane. Take Exit 27 towards College Park, MD and stay on Route 1. Continue past the University of Maryland -College Park, and past East-West Highway. The Gateway Arts & Entertainment (A&E) District begins at Olgethorpe St. on the right and Madison St on the left. Need some markers? On your route, look for the Wells Fargo Building at East-West Highway (on your left) and stay straight on Baltimore Avenue until you reach Shagga Coffee, the Oglethorpe Towers and the DeMatha Catholic High School (on your right).